I started this meal thinking a nice simple plate of cacio e pepe sounded delicious. But, I don’t eat pasta – and I didn’t have any parmesan. What I *did* have was some CSA fresh zucchini, some bacon ends, a bit of leftover baked chicken and some farm fresh eggs. Heat a pan on medium. Chop your bacon and add. Brown. When the bacon is halfway browned, add the leftover chicken and 2 chopped cloves garlic. Zoodle your zucchini however you accomplish this (I use a spiralizer that works like sharpening a pencil – there are a ton of ways to make noodles out of zucchini). 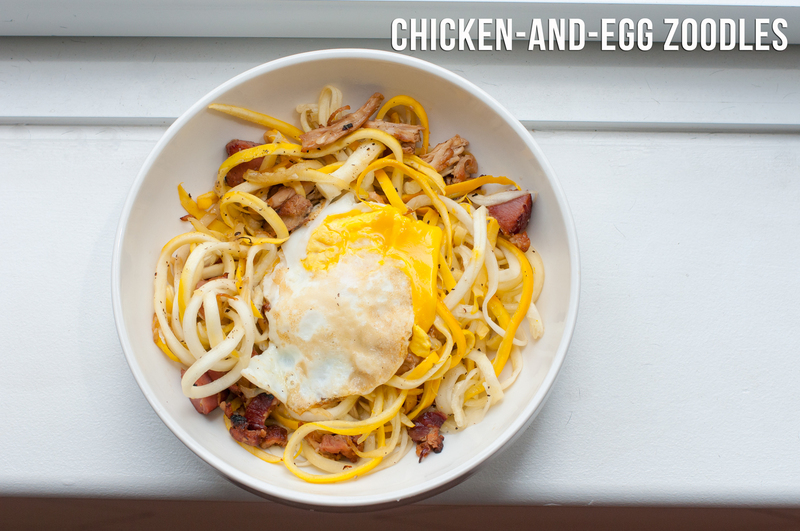 When the bacon is browned and the chicken is warm, add the zoodles to the pan and toss. Add 2 tsp. olive oil, a few cracks black pepper and a sprinkle of salt. Set aside while you fry the eggs. Put your pan back over the fire and add more fat. Fry the eggs and use to top the “pasta”.